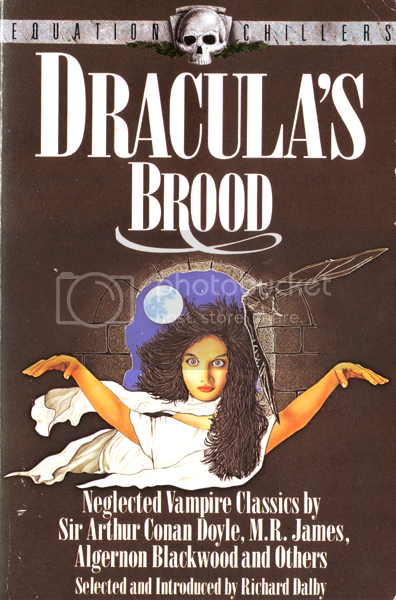 Richard Dalby - Dracula's Brood | Vault Of Evil: Brit Horror Pulp Plus! Edward Heron-Allen - Another Squaw? Frederick Cowles - Princess Of Darkness: Now we’re in Budapest, and the clutches of the 400 year old Transylvanian Princess Bessenyei, so no prizes for guessing she’s a full on vampire with all the trappings. Wherever she goes, she leaves a trail of dead lovers in her wake until Harry Gorton, an English diplomat, teams up with his occultist friend Istvan Zichy join forces against her. A marvelous pulp romp with a suspenseful climax, and it’s possible you won’t double guess the ending. E. R. Punshon - The Living Stone: “What could any man do against fifty tons of granite made animate?” Good question, especially when it flings itself upon you with a great leap and gluts on your blood. The professor, researching human sacrifice in Cornwall, stakes out the ‘hunting stone’ in Missing Lane following a series of mysterious disappearances in the locality. Hume Nisbet - The Old Portrait: Utterly charming Victorian horror. When he scrubs away the “bloated, piggish visage of a landlord” from the canvas, he discovers the masterly portrait of a beautiful woman underneath. Fascinated, he spends Christmas Eve gazing at his find. Come midnight, and the lovely lady comes floating out of the frame..
Hume Nisbet - The Vampire Maid: A reclusive artist takes up residence in a cottage and falls for the attractive invalid Ariadne Brunnell. Her health begins to return. Mary Elizabeth Braddon - Good Lady Ducayne: Bella lands the position of ladies maid to the ancient, wizened Adelaide Ducayne, and spends the winter touring Italy with her and sinister physician Dr. Parravicini. The old girl’s is soon dramatically improved, although Bella isn’t feeling too clever …. Edward Heron-Allen - Another Squaw? : Title alludes to Stokers horrible tale of the American tourist, the cat and the Iron Maiden. This one is set at a Marine Biological Station, and relates the events leading to the death of Jennifer Pendeen B.Sc., savaged by an Angler fish. Horacio Quiroga - The Feather Pillow: Even given the heady standards set by the The Living Stone, The Sumach (an excellent ‘vampire tree’ outing) and Another Squaw?, this one is pretty bizarre. Recently wed, Alicia is wasting away before the eyes of her dominant husband. What could be causing her illness? (Clue: it isn’t a haunted hot-water bottle). H. B. Marriott Watson - The Stone Chamber: Utterbourne Village, Devon. Rupert Marvin, an eighteenth century rake and murderer, does his little bit to upset the wedding plans of the besotted Warrington and Marion. You’ll most likely prefer Warrington when he’s demonically possessed by the vampire, boozing, cursing and pawing every woman in sight. Not a patch on the same author’s The Devil On The Marsh, but good fun none-the-less. Sabine Baring Gould - The Dead Finger: When it comes to leftie-haters, very few could outdo Dennis Wheatley, but the Rev. Sabine Baring-Gould certainly gave it his best shot in this 1904 shocker. Who is to blame for the vampiric digit which persecutes our narrator so? As the undead himself explains: whinging paupers! I’d so have that engraved on my headstone if only I could afford one! I'm not sure how easy it is to find either edition at a reasonable price, but if you can put up with reading from a computer screen then you can download the majority of these for free from horrormasters. Vincent O'Sullivan - Will: A man despises his wife so much he wills her to death, draining the life from her with his hatred. Before she dies, she swears that she will haunt him from beyond for what he's done, and true to her word, she is with him from that day forward, until the happy couple are reunited. "On a night which was the last of the moon, he heard a singular scraping noise at his window, and upon throwing open the casement, he smelt the heavy odour which clings to vaults and catacombs where the dead are entombed. Then he saw that a beetle - a beetle enormous and unreal - had crept up the wall of his house from the graveyard, and was now crawling across the floor of his room ...."
Had forgotten how great his stuff is until a recent re-read of The Business Of Madame Jahn. Should've voted for him in the Wordsworth poll, though I see he did well enough! Ghost Story Press put out Master of Fallen Years: Complete Supernatural Stories in 1995, but a Wordsworth would be most welcome. Phil Robinson - The Man-Eating Tree: Adventure of the great traveller, Peregrine Oriel, hunting deer in Central Africa. When one of the native children, Otona, tries to trap a wounded fawn, he's attacked by the vampire leaves of the evil tree. Attracted by the boy's screams, Oriel shoots the tree as he would anyone who disobeys his orders, but it's no use. Eventually, what's left of Otona is dragged free of "the ghastly relics of many former meals", but cleaning him up would take too long, so Oriel's men dig a hasty grave and bury him with the leaves still sucking away at his blood. Ulric Daubeny – The Sumach: Irene Barton inherits Cleeve Grange from cousin Geraldine who died of acute anemia. Before she passed away, Geraldine developed a morbid fear of a tree which still stands in the garden - the Sumach. "The foliage was unusual, and the branches gnarled and twisted beyond recognition. Just now the leaves were stained with splashes of dull crimson, but rather than droop, they had a bloated appearance ..." Maybe Irene was a little hasty in deciding to bury her her dog, Spot, under the tree, but she has other things to worry about: she's fast wasting away from the same mystery illness that did for Geraldine! It transpires that a suspected vampire was once buried on the spot and the Sumach has grown from the stake driven through its heart. Mrs. Watcombe, nosey neighbour, knows the solution, but will Irene's husband return from London in time to save his fast ailing wife? In terms of overall plot, but not how the story is told, "The Tomb of Sarah" bears many resemblances to "An Episode of Cathedral History". Both are worth reading. For handiness, both are included in a new anthology, THE VAMPIRE ARCHIVE, edited by Otto Penzler. It has over a thousand pages and I got it from Amazon for £9.99. It is the thickest paperback I have and seems to have plundered every other anthology of vampire stories. It has many good stories among its 80 plus items, like "The Tomb of Sarah" and "An Episode of Cathedral History", and many bad ones. You can decide yourself. Looks like the new anthology owes a bit to Richard Dalby's Dracula's Brood for the early stuff. Why not try for both? The latter volume seems to squib out when it comes to the "Vampire things" type of story. The Fate of Madame Cabanel is quite grim. I was waiting for the said lady to be rescued or at least to exact revenge or even a twist ending with her accusers proven correct, but no such luck. She does seem a bit oblivious to her predicament, and was it really a good idea for her to get the blood of the infant she is suspected of feeding upon all over her lips? The Man-Eating Tree reminded me of the highly suspect reports of such things that circulated in the late 19th century, and possibly they were Robinson's inspiration for the story. There's a sizeable preamble which I thought could have been omitted without any effect on the narrative. The Fate of Madame Cabanel is quite grim. I was waiting for the said lady to be rescued or at least to exact revenge or even a twist ending with her accusers proven correct, but no such luck. That's what I most like about it and why, suspenseful as they are, I'm not planning to go gaga on Dean R. Koontz novels. Had Mr Koontz written ... M. Cabanel there's no question human goodness would have prevailed and the heroine been spared her ordeal. 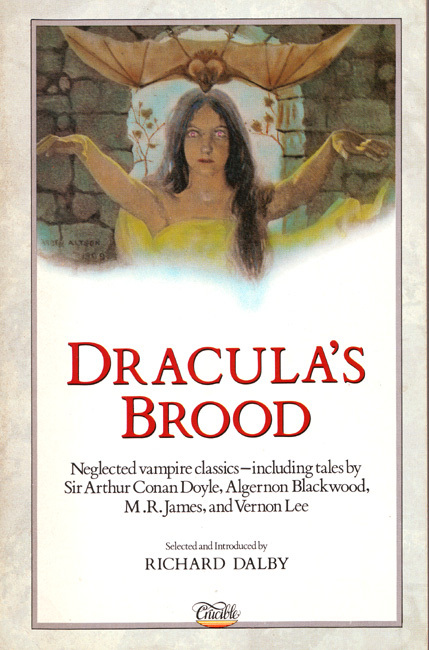 Dracula's Brood is such a wonderfully varied collection it puts just about every other vampire-themed anthology to shame. The Feather Pillow, The Living Stone, and the proto Hammer Horror, Princess Of Darkness, are huge personal favourites. The finger on the rampage in Rev. Sabine Baring Gould's hysterical party political broadcast is my all time hero ... or was, until The Legs That Walked marched into my life. This is the cover of the edition I have, which I ordered from Barnes & Noble's print catalog in the early 1990's. Edvard Munch is certainly an upgrade on the Equation house artist. 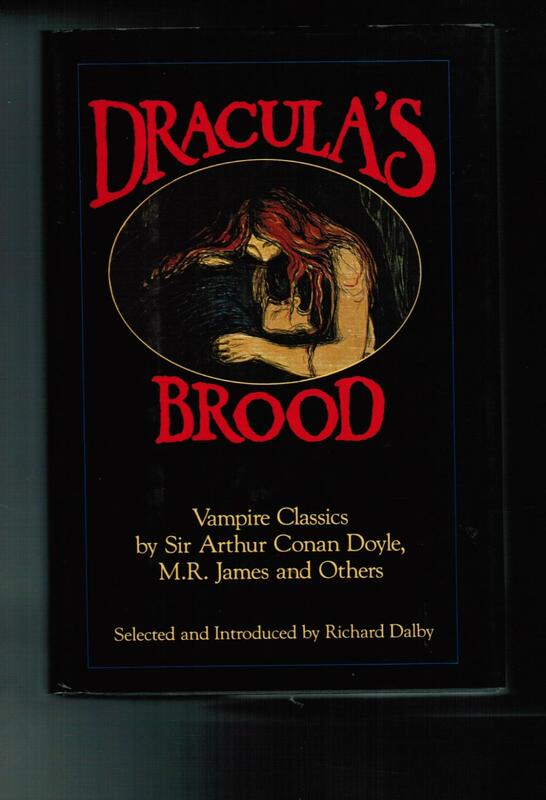 I agree with you, Dem; Dracula's Brood is a great anthology, with a wonderfully varied selection and is probably my favourite vampire collection. The Stone Chamber is another that didn't quite go where I was expecting. Poor Warrington loses his lady love after trying to assault her in the garden while possessed. I thought our narrator would sort it all out and bring the couple together, but he's not above lusting after her following his unwise move to sleep in the stone chamber and Warrington's flight to the continent. Also, the fate of the maid is only hinted at, but we can guess what Warrington did to her. A good story which I thoroughly enjoyed. The Old Portrait and The Vampire Maid: I view these as the Ant and Dec of vampire fiction, for they are rarely seen apart. Two simple tales that don't outstay their welcome. As Dem said, they do have a charm about them. The Living Stone: This one doesn't hang about and I thought it was an enjoyable and highly unusual tale. I warmed to the Professor and wondered if Punshon featured him in any other stories. Another Squaw? : Dalby includes a very unusual type of vampire story with a nasty ending. What struck me was the author's choice of a lady marine biologist as main character--unusual for a woman to be shown as having a scientific career at the time I would have thought. The author saw fit to recap the plot of Stoker's story 'The Squaw' as a preamble, probably to explain his choice of title to readers unfamiliar with Stoker's classic. Given the original publication dates it looks like Punshon did not feature the Professor in any other stories. Thank you, Michael. That's a pity; I was hoping for more tales featuring the Professor. I can't recall reading anything else by the author but this story entertained me greatly.